For the troops in the trenches, it began in 1982 with a low generation copy of a local band’s three-song demo. For some, it began with their first listen to Combat Records’ version of Bonded By Blood in 1986. Still others will say what really mattered began on August 11th, 2001. Regardless of the year, these dates all have one thing in common: the tenacity of Gary Holt. One cannot discuss the power and influence of EXODUS without going into the genealogy of metal music itself. Long hailed as the band that spawned the burgeoning Bay Area Thrash scene in the early ‘80s, the band’s most admirable quality is that the word “surrender” has never existed in lead guitarist/songwriter/General-In-Chief Gary Holt’s vocabulary. Surviving decampment (original guitarist Kirk Hammett left to join Metallica in 1983), death (original vocalist Paul Baloff died in early 2002), untimely disaster (long-time second vocalist Steve Souza abandoned the band in 2004 on the eve of a South American tour), dejection (original drummer Tom Hunting was incapacitated by panic attacks in May 2005), and drug abuse (guitar comrade-in-arms Rick Hunolt’s resignation in June 2005 was due in part to addiction issues), it would have been easier for many to interpret these events as a signal to retire, but then again, not everyone is Gary Holt. At the beginning of their career, EXODUS gained huge notoriety in the international underground scene as a result of the tape trading community. Their dynamic guitar riffing, adrenaline-inducing drum work, and bloodied live shows made all the difference in the band’s mission to take Bay Area Thrash to a worldwide audience. By 1983, the band line-up included guitarist Rick Hunolt and bassist Rob McKillop and had inspired the likes of Metallica, Testament, Death Angel, and Vio-lence. EXODUS’ debut, the immortal, must-have, undisputed thrash classic Bonded By Blood was released in 1985 via Torrid Records (then re-released in 1986 on Combat Records), and a vast tour with Slayer and Venom propelled the band into a household name. Shortly before recording Pleasures Of The Flesh (their 1987 album for Combat Records), lead vocalist Paul Baloff left the band due to personal and musical differences and was replaced by ex-Legacy vocalist Steve “Zetro” Souza. That line-up’s creativity led to Combat’s Fabulous Disaster in 1989, and ultimately awarded the band with a major label contract with Capitol Records. 1990’s Impact Is Imminent and 1992’s Force Of Habit had EXODUS steadily touring with Pantera, Suicidal Tendencies, Anthrax Motörhead, Black Sabbath, Metallica, and Megadeth; however, the changing musical climate brought on by the commercial infiltration of grunge dawned the death of the careers for the majority of the scene’s metal bands, including EXODUS. A brief reunion with original vocalist Baloff occurred in 1997 long enough for the band to recruit bassist Jack Gibson (Vile), tour through Europe and North America, and record their second live album, Another Lesson In Violence. Four years later, EXODUS’ future convened in an unexpected way on August 11th, 2001. Holt, Hunting, Baloff, Hunolt and Gibson were invited to participate – alongside the Souza-led Legacy, Heathen, Forbidden Evil, Anthrax, Death Angel, and Vio-lence – in the spectacularly billed Thrash Of The Titans benefit show for Testament singer Chuck Billy, who was suffering from cancer and undergoing chemotherapy. 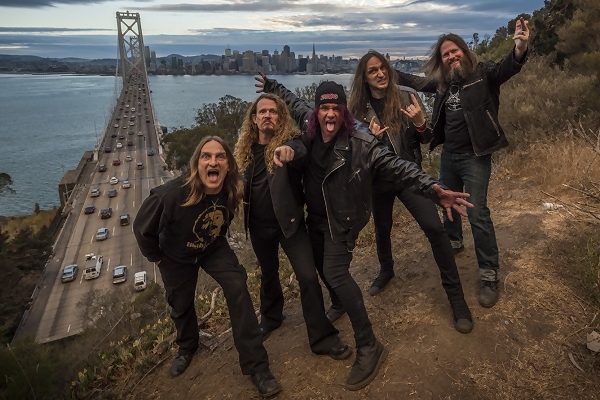 Originally intended as a one-off show by many of the enlisted performers, Thrash Of The Titans single-handedly paved the way for the reunion of many Bay Area thrash bands that had literally vanished from the scene. Following the benefit, EXODUS began writing music again, but Baloff’s untimely death from a stroke on February 2nd, 2002 placed the reformation attempt on hold. Launching a search for a new vocalist, it was Souza who ultimately returned to the microphone to help record EXODUS’ 2004 visceral comeback album, Tempo Of The Damned. Produced, engineered, mixed, and mastered by Andy Sneap (Megadeth/Arch Enemy/ Kreator) and featuring artwork by Jowita Kaminska, the universal euphoria generated by TOTD (which landed on innumerable “Best Of 2004” lists in magazines around the world) suggested an invigorating new start for EXODUS, but the subsequent exit of Souza, Hunolt, and Hunting within a year depleted the band of three classic members… and the future looked grim. Yet, in less time than most people have EVER seen a band emerge from member loss-induced hibernation, Holt recruited two long-standing musicians who lived and breathed the same Bay Area vitality that flowed in EXODUS’ blood. On the drum throne, he appointed one of the most highly credentialed metal drummers in the world: ex-Slayer/ex-Forbidden/ex-Testament/ex-Systematic Paul Bostaph. To pick up where Hunolt left off, Holt selected godly Heathen guitarist Lee Altus who admittedly waited 20 years for the invitation to join the band. To replace Souza, a daring choice was made in enlisting a virtually unknown singer: guitar-tech-turned-lead-vocalist Rob Dukes, who had enough hate and vitriolic venom within him to convincingly spit out Holt’s murderous lyrics. The internal restructuring skyrocketed EXODUS’ talent meter, making this a dream line-up for legions of thrash metal fans all over the world. Produced by Gary Holt, mixed and mastered by Andy Sneap, and armed with the necessary maniacal passion, pain, and conviction to battle adversity, 2005’s Shovel Headed Kill Machine, EXODUS’ seventh studio album, upheld the musical veracity of thrash metal’s very foundation and pillaged straight ahead like a lead-filled battering ram into the “Top 5 Albums” year-end poll by Decibel Magazine. “When it comes to writing and performing the thrash metal they helped invent more than two decades ago,” cited Outburn Magazine, “EXODUS can hold their heads high as the reigning kings.” Two years later, their musical direction has not faltered. Imported from England in the summer of 2007 to re-join EXODUS at Sharkbite Studios in Oakland, California and record what will surely become a career- and genre-defining album was producer Andy Sneap. Featuring artwork by Seth Siron Anton (Vader, Decapitated, Belphegor) and upping the ante for all other thrash metal albums to be released this upcoming year, The Atrocity Exhibition: Exhibit A is the Master Of Puppets for this modern era’s thrash scene, a visceral auditory realization of collective consciousness that will make the hairs on the back of your neck stand on end with intimate recognition of its omnipotence. For those curious about the total number of heart-racing, eyebrow-raising, raise-your-fist-in-the-air guitar riffs, rip-tide bass lines, and double-bass flurries included on the album, only one word can convey it: Fuggeddaboutit. Affirming original drummer Tom Hunting’s exultant return into the band’s ranks is the opening drum march/battle cry “Call To Arms” that quickly bleeds into the mayhem-inducing “Riot Act”; quick to haunt you are the philosophical ponderations of war in “Children Of A Worthless God” and “As It Was, As It Soon Shall Be”; sure to impress are the guitar tonalities, the righteously complex shredding, and the overall sophisticated finesse of “The Atrocity Exhibition,” “Iconoclasm,” and “Funeral Hymn.” Crowning off The Atrocity Exhibition: Exhibit A’s sonic coup d-état is the cacophonous pacing of “Bedlam 1-2-3” which will not only ensure a dramatic rise in the National Blood Loss Index of countless mosh pits around the world, but will transform them all into Eternal Gardens of Bleeding. Can you picture Gary Holt smiling as he sees the blood splatter before him?